Side bearing to bottom of tube: 14"
If anyone has plans for a scope like this I would really appreciate the help. There were only two books at the library on the subject and they weren't much help. This will be my first homemade mount. Thank you so much. How handy are you with wood working tools? The two most important dimensions for planning a dob base are the width of the tube (including any altitude bearing flanges or a box built around the round tube) and the length of the tube from the pivot point to the bottom "corner" of the tube. I would recommend looking through the Reflectors forum at threads like "Show Us Your Dobsonian" and the "Mega-Mods" threads. There you will see lots of cool dobs in amazing variety. Even if you're not handy with building, finding a design that inspires you will help you or a friend draw up a successful design. Since this is a 6" scope, you're not going to need a ton of wood. I'm sending you a private message with a specific idea on an easy way to have an adjustable altitude bearing to help you with balancing your rig. Hi, Stargazer! Congratulations on your new optical tube! There are plenty of plans for Dobsonians on the web, but finding one that exactly suits your particular tube may be challenging. It's probably easier to create your own plans; you already have most of the essential measurements. If you could take a few photos of your tube and post them here, that will make things easier for us as we help you along. One of your first decisions should be whether to cut out the sides of the rocker box around the altitude bearings, or to have the sides enclose the bearings. Cutting away the sides will allow the tube to shift sideways in the mount until it rubs, unless your bearings have shoulders to prevent this. Go to Orion's website (telescope.com), zoom in on the XT6's bearing and you'll see the shoulder clearly. If your bearings don't have such shoulders, you can add them, or you can enclose the bearings inside the box as on the XT6 Plus. Which way you go will determine the width of the box, so give that some thought right away. 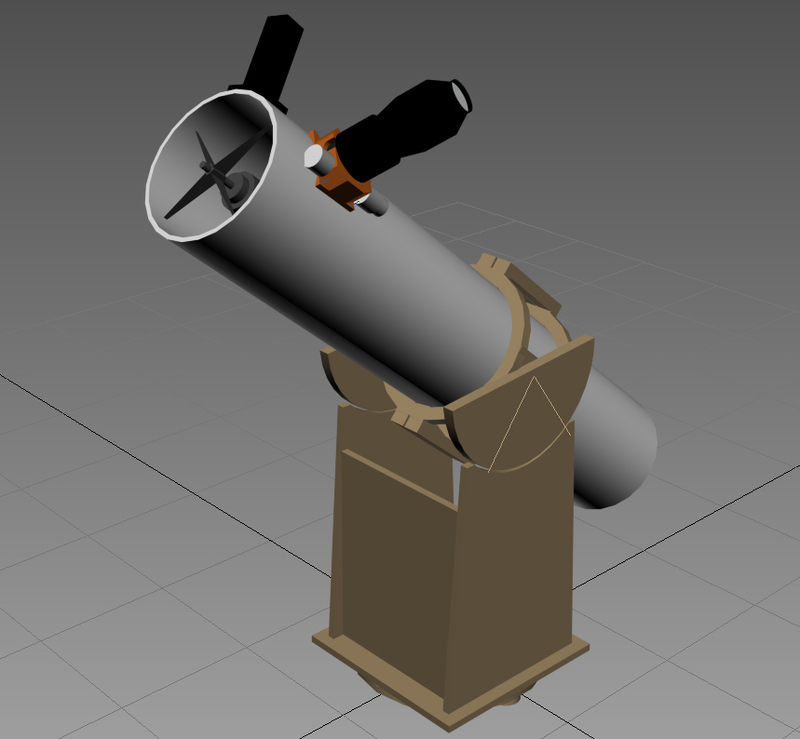 Think, too, about whether you want to make a plain box (the classic Dobsonian) or something more styled, like the Orion mounts. Do you have a table saw, or will you be working mostly with hand tools? Also consider what type of material you'd like to use, because this will affect the design to some degree. Softwood plywood from your lumberyard is inexpensive and strong enough, but it's hard to finish attractively. Baltic birch (hardwood with many thin plies) is a favorite: stronger, denser, and much nicer looking, but of course more expensive. It looks good with a clear finish or stained. Finally, think about whether you'd rather sit or stand to use the 'scope, as that will determine the optimal height for the eyepiece. I made a Dobsonian mount for my Orion 8" f/5 optical tube. The tube measures 9.25" diameter by 38" long, and about 15.75" from the altitude axis (center of the bearing) to the bottom of the tube. My finished box is 12" square (outside dimensions) by 24" tall (again to the altitude axis) and turns on a triangular plate with the feet spaced 16.5" apart. I built it a little taller than need be to put the eyepiece at a comfortable height for viewing from a folding chair. Depending on your observing preferences, yours will probably end up fairly similar in size. I left the optical tube slightly bottom-heavy and use a magnetic counterweight at the upper end to balance it with my lighter eyepieces. if you know how to dimension off of sketchup [its real easy] I posted the 3d model in my warehouse. Edited by Pinbout, 27 August 2015 - 12:24 AM. I'm not able to upload any pictures of it. It keeps saying file too large. But I can tell you that it's a Turco. The measurements are what I took of the scope itself and where it will sit on the mount has to be round. Like the Orion classic dobsonian mounts. it has to be smaller than 500kb. increase the compression - lower file size. Pinbout's sketchup is a great starting point. Any difficulty in getting the dimensions from it, Stargazer? Thanks for the photo. I would choose a finder and install that, then put an eyepiece in the focuser and see if the tube balances around the existing bearings. If the finder throws it off, you'll need to relocate the bearings to get the balance right, OR build the classic tube cage (shown in Pinbout's model) so you can shift the tube to rebalance it later. The tube cage is much more versatile, but requires a wider box. This is an important design element, so consider the alternatives before you go too far. If you choose fixed hubs, I suggest you leave the tube bottom-heavy so you need to add a counterweight to the top; I've always found this more convenient than adding weight to the bottom. This will leave room for upgrading later to heavier eyepieces without reengineering the scope. You might also think about putting setting circles on the 'scope so you can use a planetarium app on your smartphone to show you where to find stuff. You can always add these later, but it's easier to incorporate them into the design from the get-go. One advantage of oversized altitude bearings (see Pinbout's model) is that the large radius allows for a very readable altitude dial. The small hubs you have now would not. I put an azimuth circle on the base of my homebuilt Dob, and use it together with a digital clinometer that displays the elevation (altitude) of the tube. It really does help in locating those faint fuzzies. Edited by enwent, 29 August 2015 - 11:00 PM.